A perfect guide to hosting a fabulous Burns Night celebration! Looking for the perfect last minute Christmas Gift? It’s never too late to get my book in time for Burns Night in Jan! Daniel has been hosting a legendary Burns Night supper for 21 years now, in locations as diverse as Edinburgh, London, Los Angeles & Marrakech, so who better to talk you through your own Burns Night celebration? 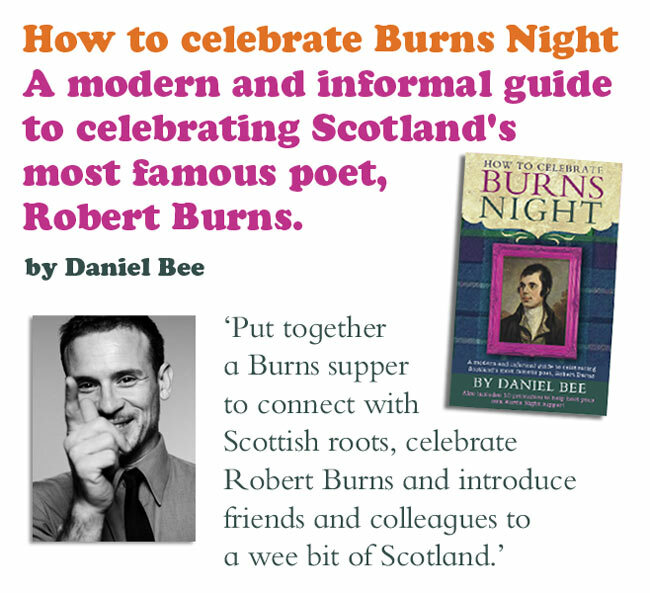 Daniel Bee has come up with this 2016 guide to hosting a modern, fun and stress free Burns Night celebration. This fun and concise guidebook is packed full of helpful information and easy to follow advice. A suggested order of events, poems and song lyrics, menu ideas and even tips on how to cook the haggis. I always get asked about certain aspects of a Burns Night Supper. Such as What to wear? What happens on the night? What food shall I serve? 7) What to drink? Which Whisky to choose? 8) Short biography on Robbert Burns. ← Why have Burns Night Suppers been celebrated for 215 years?